WARNING: See critical warning below relating to proper selection of valve model related to application. The Invensys FP Freeze Protection Valves utilize a reliable self-contained Dole Power Element which is sensitive to temperature and operates without any electrical power or sensors. Typically in solar applications, the valve port opens on descending temperatures allowing the near freezing water in the solar panel to be discharged and replaced with warmer supply water. When the warmer water reaches the valve, the port closes and water discharge stops. This cycle will repeat as often as necessary to help prevent freezing. The amount of water dispensed depends mainly on ambient air temperature, make up water temperature, the duration of the cold spell and the number and size of collectors. The system is functioning properly when water is being discharged from the valve during near freezing conditions. For water to be discharged at the time of operation, system water pressure must be maintained. so that when the valve opens, water flows as evenly as possible through all the collector tubes. Location of the valve may vary depending on the system design and piping. 2. IMPORTANT INSTALLATION NOTES: Select a mounting position where the valve will sense the coldest anticipated ambient temperature. When used in conjunction with active systems, the valve should also be located within close proximity of the collector outlet with 2"-6" offset below the collector header (see illustration). Do not mount in a position where the valve will be exposed to an unnatural heat source (i.e. poorly insulated roof, dryer or furnace vents, etc). The plumbing from the collector outlet to the point where it penetrates the roof should be insulated (this will prevent heat loss, and protect the piping from freeze damage in cold temperatures). The Freeze Protection Valve must be connected to the main return line from a tee fitting and have 8”-10” of copper piping between the tee and the valve – this section of pipe must NOT be insulated, and must be painted black to properly simulate the collector sensing outside temperature conditions. This section of pipe should be no less than 1/2” diameter, and preferably be 3/4” diameter (even if the main return line is only 1/2” diameter) to provide maximum surface area to sense outside temperature conditions. This section of pipe must be 1”-2” below the outlet pipe to prevent exposure to high temperatures that can develop near the collector outlet (see illustration). between 20 and 125 PSI at all times for the valve to operate properly. Do not shut off water supply to the collectors or isolate the collectors from the city water supply. 4. When a check valves is required in the return line, be sure it is operating and installed in a proper location with respect to the Freeze Protection Valve. Water flow must be prevented from “bypassing” the collector. If the check valve leaks internally and does not properly seat, water flow may be bypassed through the check valve rather than through the collector. 5. Do not insulate the Freeze Protection Valve or exposed pipe between the collector return line and the Freeze Protection Valve. Any other section of exposed pipe where no water flow exists during valve operation should be heavily insulated. 6. Install by applying torque with a wrench to the square metal inlet flange. Do not apply torque to the plastic body. 7. For proper utilization of the anti-siphon port, the Freeze Protection Valve should be installed in a vertical position with discharge port down. To prevent wasps or other insects from nesting inside the discharge port which could cause blockage of water flow, wire or plastic screen (not included) can be placed over the openings and secured. Be sure that the screen will not interfere with discharging water. 8. 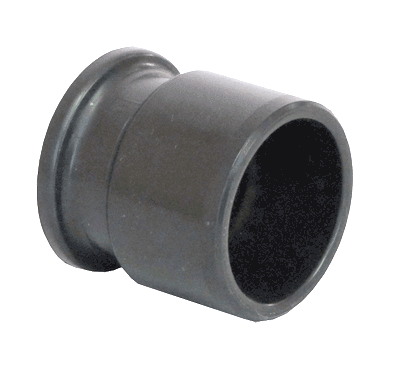 To enhance customer satisfaction of this product, we recommend a plastic discharge tube be connected to the 1/4" pipe threads or the 5/8" barbs, then routed to a safe, nonobjectionable location where the discharged water will drain. 9. If a discharge tube is used, make sure it will drain freely and is installed in accordance to local codes. Avoid water traps in the discharge tube that could freeze and prevent drainage. The valve has an alternate path for discharge water flow should the discharge tube become impaired. 10. Do not attempt to disassemble the top cover. The inlet retention flange can be removed to inspect the screen for periodic cleaning and replacement. Product Manufacturer: Invensys Appliance Controls. Dole/Invensys Energy Control Products are warranted by the manufacturer to be free from defects in material and workmanship for a period of one year from the date of installation, when properly installed and used in accordance with the installation instructions. Invensys obligation is limited to the repair or exchange of the defective parts and does not include reimbursement for any removal or installation expenses. To make a claim under this warranty please contact Solar Direct for return instructions. This warranty is in lieu of all warranties expressed or implied, including warranties of merchantability and fitness for a particular purchase. NOTE: During cold weather, it is normal for the valve to dispense water from its discharge port even when ambient air temperatures are several degrees above freezing. WARNING: Solar collectors can reach internal temperatures up to 10 degrees below the outside ambient air temperature. Standard Active Open Loop Solar Systems typically require a model FP45 valve to ensure proper protection. Passive Batch or Integrated Collector Storage (ICS) systems such as the ProgressivTube have a much larger volume and mass of stored water, and will not freeze as quickly as a Active Open Loop Solar System, therefore they can typically utilize a model FP35 valve. This condition results from a phenomenon known as “night-sky emissivity”. The emissivity of a material is the ratio of energy radiated by the material (solar panel) to energy radiated (or absorbed) by a black body (the sky); it is a measure of a material's ability to absorb and radiate energy. Since solar collectors are coated with a black surface they are very good at conducting and emitting energy. When the outside temperature approaches freezing, the surface of the solar collector begins to emit energy to the night sky. When the atmosphere is clear with no clouds, the transfer of energy is accelerated. In layman terms, this means that on a cold clear night, the water in the solar panel can be up to 10 degrees colder than the outside temperature. A Freeze Protection Valve needs to begin opening when the outside temperature drops to 42 degrees and below. As the temperature drops from 42 to 32 the volume of water discharged from the valve increases. Consult the owner’s manual of your collector and/or system to determine the correct valve model to use; Solar Direct and/or The Energy Supermarket makes no claim as to the correct valve to use, and/or its usage and application; and assumes no liability for damages resulting from correct or incorrect use of this product.